Finally, I had a chance to publish more photos! 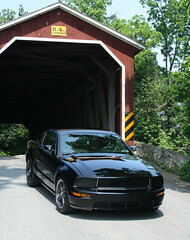 This is my uncles Bullitt Ford Mustang that he had me take photos of last week. It’s a really hot car. Since it was almost noon when I took the shots, the lighting was on the crappy side, but I did the best I could. He and I both really like how the car seems to be coming out of the covered bridge.